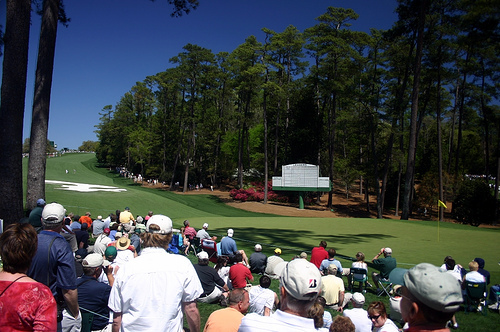 Sports Costs > How Much Does an Augusta National Membership Cost? How Much Does an Augusta National Membership Cost? The Augusta National Club, located in Augusta, Georgia, is recognized as one of the most popular golf clubs in the world being the home of the annual Masters Golf Tournament since 1934. Membership to the club is strictly by invitation only. How much does an Augusta national golf club membership cost? This Huffington Post article states that the Augusta National Golf Club initiation fee is $10,000 to $30,000. According to a BleacherReport.com article, the cost to join the club is reportedly under $100,000. An article at Golf.About.com cites an article in which an anonymous club member told Golf World in 2009 that the initiation fee is in “the low five-figures.” Another source said that the monthly dues amount to “a few thousand” dollars each year. A membership to the club, unlike other clubs, is by invitation only. When a membership spot opens, which is kept around 300, the club decides who they would like to invite and will mail out an invitation. According to ThoughtCo.com, a membership spot rarely opens up and only does so when a member passes away or is told to leave. The club does maintain a list of prospective members based on recommendations by its current members. The criteria, according to the experts, has said to be a secret. Lodging and dining costs are not part of the membership fees. Lodging fees, either via the lodge or cabins on site, are said to be a pinch more than $100 per night. Famous Augusta National members include investor Warren Buffett, banking kingpins Kenneth Chennault, Sanford Weill, and Douglas Warner, oil tycoon T. Boone Pickens Jr., Microsoft head Bill Gates, publisher Nelson Doubleday, automobile magnate Harold Poling, as well as former president Dwight Eisenhower. Bloomberg.com created a list showcasing the 118 most powerful members currently at the club. The waiting list has said to be about 300 people long. Members can bring in non-members, provided they accompany their guests at all times. Augusta National reportedly has one of the most excellent private wine cellars in the world and includes collections of the best American, Australian, French and Italian wines. In August 2012, the Augusta National board of directors extended membership to only two women, following controversies regarding its policy stating only men can be accepted as club members. These two women included Darla Moore, a South Carolina businesswoman, and Condoleezza Rice, former United States Secretary of State. The only two professional golf players who are known to be members of Augusta National are Jack Nicklaus and Arnold Palmer. Augusta National is open for about seven months of the year. It closes in late May, specifically after The Masters, and opens again in the middle of October. Want to play the course, but don’t know someone? It has been said if you volunteer for the tournament, you’re able to come a month later, after the tournament ends, to play the course. According to the Golf Digest, the Augusta National golf course is one of the few courses to have never been given an official course rating by the USGA.